R contacted me after seeing one of her closest friends had just finished a boudoir session with me. She and her husband had just moved into their new home and this is how she wanted to document it. How cool is that?! I'm all for doing in-home sessions, as I feel they add a very personal element. She told me that they barely had any furniture in it, but that got me excited. Photographing R in her home was like having a blank canvas. She had beautiful, large windows and gorgeous hardwood floors. I walked into one of her rooms and the only thing in there was a chair and guitars. I had to know the story behind all of the guitars. It turns out that her husband builds guitars and they are both musicians, on top of of their already high-stressed jobs. We made sure to get some photos of her (a lot of photos of her) in the room that had the guitars. I wanted this session to be all about R, but I also thought it would be neat to have the background of guitars in some of her photos. R then told me that she never had photos in her wedding dress. She and her husband had a very small and intimate wedding and they never had any photos taken. She pulled out this gorgeous gold dress and we headed outside. 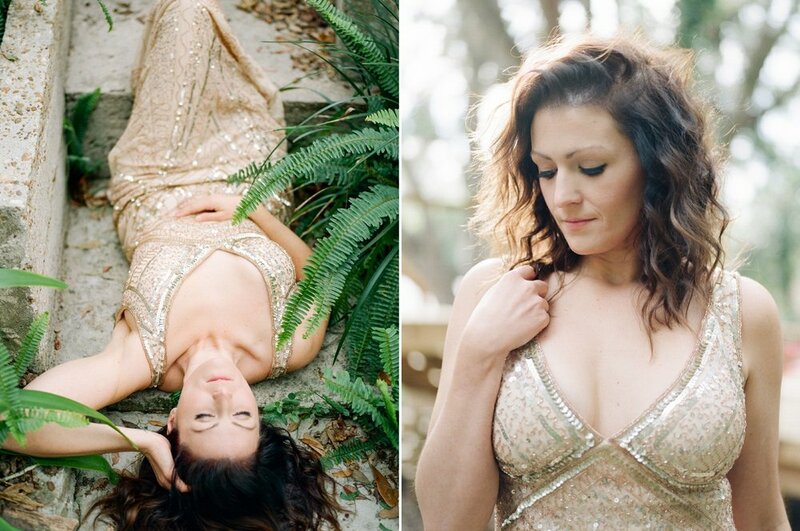 We ended up with some pretty stellar, sun-drenched portraits of her in her wedding dress. One of my favorite photographs from the session is R sitting on her bathroom sink. We walked by her bathroom and I spotted this light that I knew would be my favorite of the day. I told her to sit in her bathroom and she completely trusted me. These portraits ended up being some of her favorites. I'm still amazed that I get to do this for a living. I'm honored that women let me into their lives and share their strength and vulnerability with me. I love being a West Palm Beach boudoir photographer!